Subclass 600 Visa Refused - Visa Officer Overlook some of the facts what are my options? I have applied for a tourist visa Subclass 600 which got rejected and I believe that the reasons for this are not correct, and they have overlooked the documents and cover letter I submitted. 1- Financial: I have declared my property (residential land) and car (worth 1.4 Million) as fixed assets, I agree that money could be transferred overseas but I can not sell my property without my presence in Pakistan, this nullifies the first allegation. 2- Previous Travel History: I have a valid UK visa which I haven't activated yet but I do have attached previous UK visa copy as well which was used from OCT 7th 2018 to OCT 12th, 2018. This nullifies the 2nd allegation as a visa officer has overlooked this fact as well. 3- Employment: I am working with my current employer from last 9 months and with that, I have continuous 5+ years of employment history in Pakistan. Also, I have submitted my leave approval letter from the office which states that I have to come back to resume my duties and if I don't I will be violating my HR policies which could result into serious problems for me. Is there any way I can appeal this decision as I believe the grounds on which my visa is rejected does not stand a chance if someone reviews my application with open eyes. One of the difficulties with visitor visas is that, in most circumstances, the Department’s decisions to refuse an application cannot be challenged. The right to seek review of the refusal of a visitor visa application is limited to a few narrow circumstances – primarily cases where the applicant is seeking a visa under the Sponsored Family Stream. Thus, in circumstances where no review rights are available, the Department can, and does, seemingly arbitrarily, ignore evidence that would establish that the visa applicant is indeed a “genuine temporary entrant”. 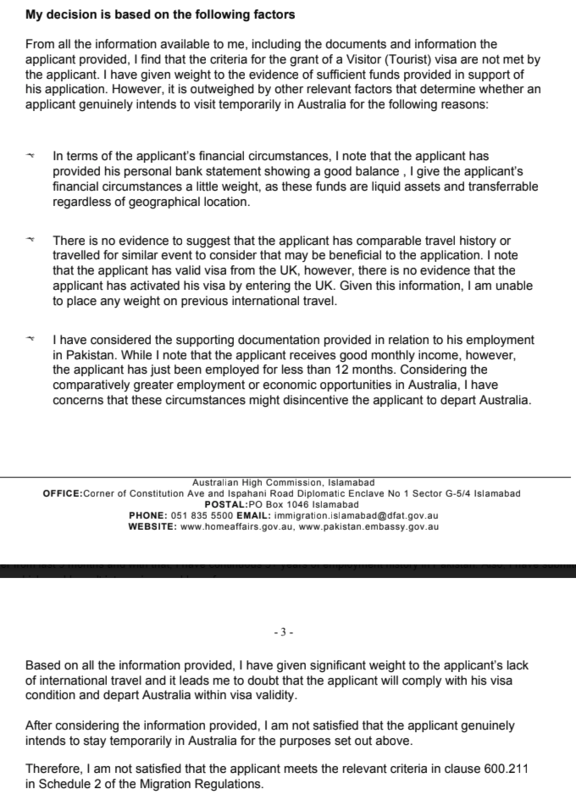 Point #1 shows bias because most people apply for visas with just bank accounts which are liquid. Clearly/she he didn’t want to approve the visa. From point #2, it is clear the visa officer overlooked your UK visit. Finally from #3, it’s evident the officer was downright incompetent or biased. Yes you have changed jobs recently, however you have been continuously employed for years. It is different if you were formerly unemployed and just for a job. A completely new application is the best (and in this case only) path forward. Additionally going forward it may be instructive to note that unfortunately most Pakistanis have lots of challenges being approved for visas in most western countries so it is important you submit very thorough applications. Not the answer you're looking for? Browse other questions tagged visa-refusals australia tourist-visas pakistani-citizens or ask your own question. UK Visit Visa refused and false allegations stated in the refusal letters. What are my options? Canadian Business Visa Refusal — why was I refused and what can I improve in a future application? UK visa refused do to lack of economic ties in the UK. What are my options? UK Visitor visa refused due to unexplained bank deposits (V4.2 (a-c)). What are my options?